Have a wonderful and slow Saturday. Wow! That’s a great shot! Have a great Saturday too! Thanks, might be a little snow in the forecast thus a little snowy fun is in store. He/she looks like a happy one! HI Eliza, yes this guy was happily strolling along enjoying the early spring day. Hope you are having a wonderful weekend. No raking for us o only shoveling snow and slush of the porch. It does feel as if the scale is tipping towards spring… just slowly this year. Thank you. Excellent timing for me. Smashed my knee cap a week ago, had surgery, and now am in the healing process. I will take heed. You have a wonderful weekend. Hi Marsha and hope your recovery from surgery is in in this case speedy and without setbacks and any rebab goes well. Have a wonderful weekend and we wish yo well. 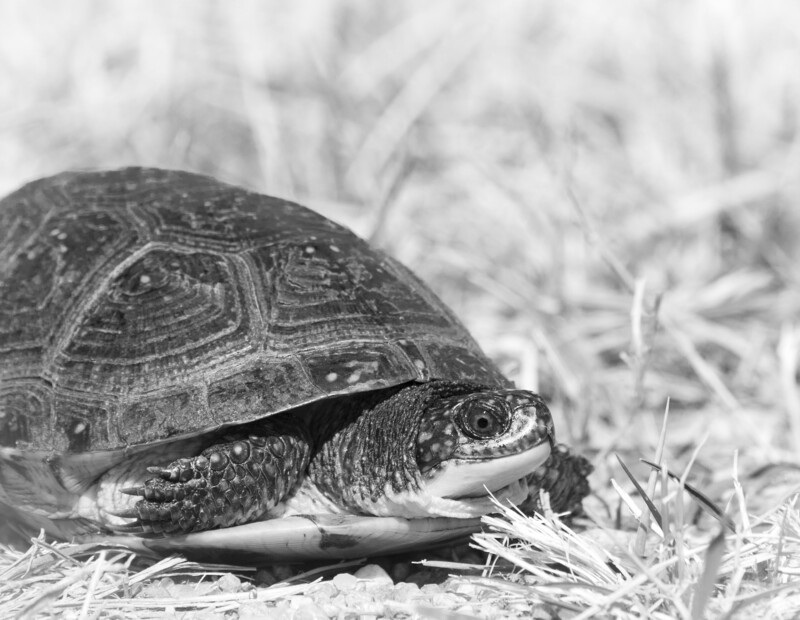 Hi Graham, this guy is in fact a turtle moving from small pond to small pond.We only have a handful of actual tortoise species in the US that I am aware of but we regularly see turtles on land moving from one water habitat to another. Ah…fair enough…he looked a bit like a land based one with the feet but I stand corrected. 🙂 Thanks for that. Not corrected just a hypothesis adjusted. A lovely way with words…😄…and a great photographer! Some friends who live down in SW Virginia have an abandoned peach orchard on their property and when they discovered one late runner day, they found it frequented by box turtles, happily eating the fallen fruit. Those must have been happy turtles. I bet they were smiling! and with full bellies to boot.